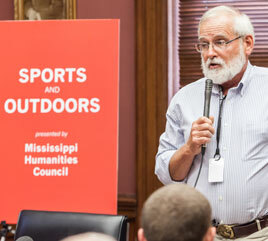 We deeply appreciate any and all contributions to help make the Mississippi Book Festival an annual event and keep it FREE and open to the public. Donations at any level from readers like you are vital in this event’s continued success. Celebrate and spread the love of reading and good writing with a donation through our fund at the Community Foundation for Mississippi, a 501(c)3 nonprofit organization registered in the State of Mississippi. The Mississippi Book Festival is made possible through the generosity of individuals, businesses, foundations, and partners. Funders help provide the annual event and keep it FREE and open to the public. With these benefactors, we bring books to life for children in low-income schools, champion Mississippi’s public libraries, and connect authors and readers at events year-round. We welcome your support through our fund at the Community Foundation for Mississippi, a 501(c)3 nonprofit organization registered in the State of Mississippi. 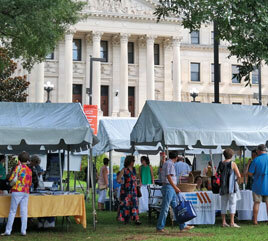 For more information, email us at info@msbookfestival.com. 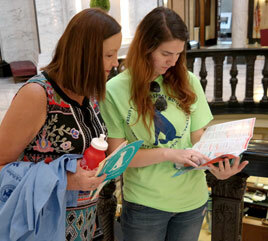 Download the 2019 Funder Invitation and 2019 Funder Pledge Form today and join us in making this year’s Mississippi Book Festival the best ever! Interested in joining the “bookie” volunteer crew, sign up coming soon! AUTHORS (self-published and/or published) are welcome in Authors Alley — a large exhibitor tent with tables at the heart of the festival. Please note: Official Panelist authors are not included in this space. BOOKSELLERS are showcased at the center of the festival in our large Booksellers Row Tent, conveniently located directly across from the Book Signings Tent. ORGANIZATIONS (non-profit, government, charitable) have it made in the shade with a provided tent and table in the Community Lawn on the Capitol grounds. Please note: No sales are allowed in this area. 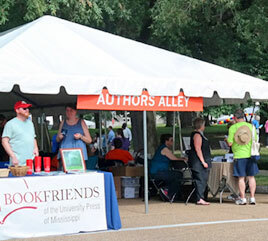 Ask for more exhibitor participation information at info@msbookfestival.com or view the exhibitor overview PDF here. 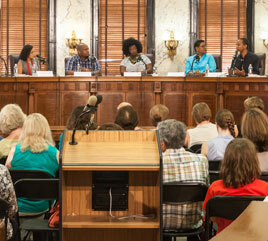 The Mississippi Book Festival each year sponsors approximately 30 Official Panels, in which moderators lead small groups of authors in a discussion of their books. Panels are typically built around a theme (e.g. civil rights history, Southern cooking, historical fiction, poetry). Our author selection committee of publishing and book professionals actively pursues potential panelists for topics, considers submissions, and sends invitations. Panelist suggestions are received year-round. Suggestions for the 2019 festival must be received by May 1, 2019, (any suggestion received after that date will be considered on a case by case basis). Notifications will be issued by June 1, 2019.